On July 16, 2015 Japan and Germany communicated an agreement in principle on a new Tax Agreement. On August 7, 2015, Japanese Ministry of Education and Science and Technology (MEXT) announced that the success ratio of job hunting by university students graduated in March 2015 hit 72.6%, highest in the past 10 years. The last peak was 69.9% for students graduated in March 2008. In terms of volume, 409,754 newly university graduates secured job by March 2015, compared to 375,957 newly university graduates by March 2013. This confirms the labor market improvements triggered by the policy of the Abe government in the last two years. In fact, overall labor market in Japan has been improving considerably since Prime Minister Abe took office in December 2012. According to the labor market survey by the Government Statistics Bureau, employed persons (employees and self-employed) were 63.9 million in June 2015, compared to 62.5 million in December 2012. Thus, the number of employees has increased by 1.4 million in the past 2.5 years. The labor force (employed and job seekers) also increased significantly. The labor force in June 2015 was 66.1 million, compared to 65.3 million in December 2012. Unemployment rate declined to 3.4% in June 2015, compared with 4.3% in December 2012. Of particular note is the increasing role of female in the Japanese labor market. Of the 1.4 million increases in the employment above, female accounted for 1.2 million and male accounted for 0.2 million. Of the 0.8 million increases in the labor market participants, female accounted for 1 million and male accounted for minus 0.2 million. The increasing contribution of female in the recent labor market improvement is encouraging for the Japanese economy. It indicates the potential success of the government’s policy, motivating a significantly higher female contribution to the economy through improved carrier and management opportunities. The vacancy rate of Tokyo CBD 5 Wards descended to 5.1% in June 2015, still having further room to decrease considering the previous low of 2.7% recorded in 2007. The rents have increased 7 % from the bottom in 2013, remaining at a level of 80% from the 2008 peak. According to Japan Office Market View Q2 2015 by CBRE, rents rose in nearly all regional cites in Japan. Central Tokyo Grade A rents continue to rise at an accelerated pace. In our view this trend will continue and spread to other markets in Tokyo and regional cites as well. The rent of Greater Tokyo started to grow in 2013 and continuedgrowing through June 2015. According to an apartment rent index prepared by Sumitomo MitsuiTrust Research Institute, rents in Greater Osaka, Nagoya, Fukuokaand Sapporo were stable and gradually increasing in Q1 2015. 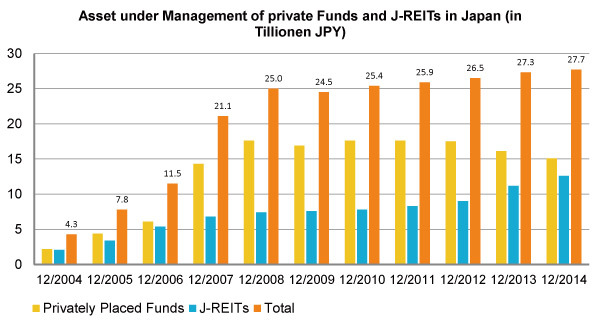 In December 2014, J-REITs and Private Funds collectively held JPY 27.7 trillion in Assets under Management (AuM; a plus of JPY 300 billion since June 2014), While J-REITs grew by JPY 700 billion, Private Funds decreased AuM by JPY 400 billion. The outlook for Private Funds though is positive, according to Sumitomo Mitsui Trust Research Institute, there are a number of overseas investors looking to increase real estate investments in Japan. According to CBRE, Q1 2015 total transaction volume rose by 8.6% y-o-y to JPY 1.1 trillion. The increase was driven by a jump in acquisitions by overseas investors who along with a rise in transactions in the Greater Tokyo Area invested in regional cities. Acquisitions by J-REITs continued to drive market activity, accounting for 45% of all transactions by value. Overseas investors transaction volumes doubled in Q1 2015 from Q1 2014 to JPY 158 billion. A report named issued by CBRE shows J-REITs share of regional investments increased again to over 40% in 2014 (from 30%). Overseas investors increased their regional investment to 18% in 2014 (from only 8% in 2009).